Finally, I'm back in the studio again. I started working on the next album for Canadian Rockers HEAVENS FIRE again. Like I did on their "Playing With Fire" album, I will be writing the record together with guitarist JT Harris and add some backing vocals. Been a bit quiet lately, I know, but here’s something new to report finally. I’m proud to announce the second single of Canadian Rockers HEAVENS FIRE “Unbroken”. 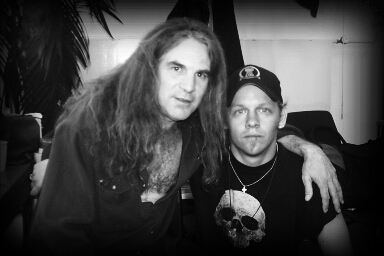 Last year, I had the pleasure to write their entire “Playing With Fire” album together with guitar player JT Harris. 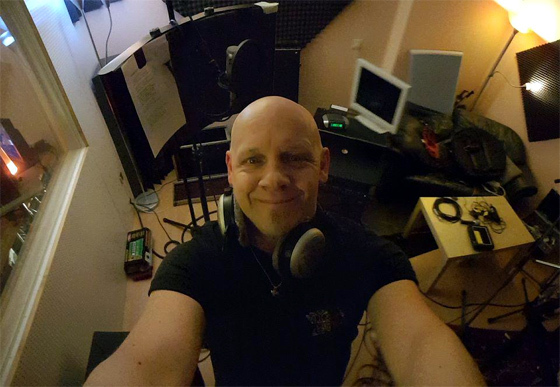 Some news from the vocal booth: I’m still working on the first full length output of German singer/songwriter MARC JUERS, who’s album I am co-producing, as well as doing some backing vocals here and there. Stay tuned for more info. 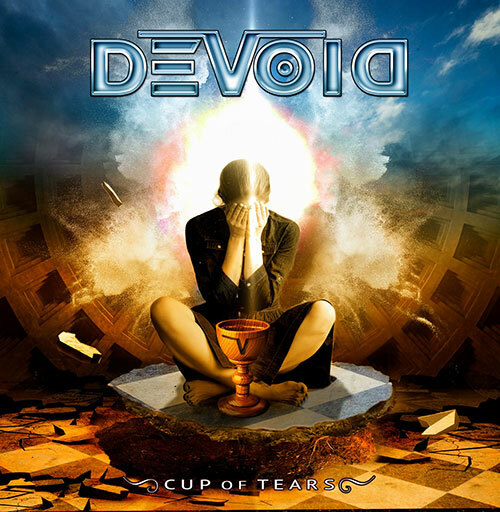 Hi guys, it is my pleasure to announce the signing of Devoid to Andrew McNeice's Melodicrock Records!!! Check out the link below for full info on who is involved and get a first impression, on what's coming at you!!! Yes, I AM FINALLY MAKING PROG!!! FULL ON PROG METAL!!!!! Been waiting for this opportunity for a long, long time....AND I LOVE IT!!! Check out this brand new lyric video from my dear friend and guitarist extraordinaire TOMMY VITALY, taken from his upcoming new album "Indivisible". ...featuring yours truly on leads. You want Metal, you got it! Please check this brand new, extensive interview from the legendary RAINBOW FANCLAN Thanx very much indeed! 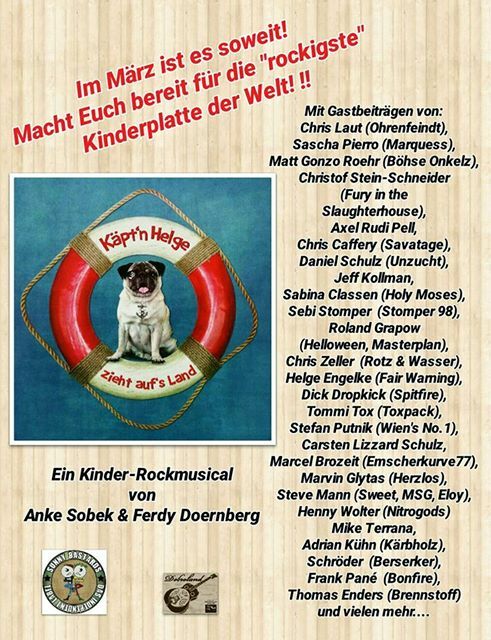 ...and now for something completely different: A little while ago, I had the fortune to record for my dear friend Ferdy Doernberg (AXEL RUDI PELL, ROUGH SILK, ex-ULI JON ROTH), who wrote a wonderful children's musical based on the life of his pug Helge! My little boy loved it from the first spin! Check the pic below for its fantastic line up. ...and yes, I do sing in German! been quiet for quite a while, so I guess it’s time to give you an update on what’s to come over the next few months. For quite some time, I wanted to record a full on Prog Metal record, so when fantastic French guitarist Mael Saout asked me, if I was interested, I didn’t have to think for a minute. The album’s currently being mixed. Hope, it’s going to find a fine label to release and push it. I had the fortune to contribute some lyrics for one track of this German Neo Classical act’s upcoming next album. Sometimes fate takes strange turns. After my dear friend Iain Ashley Hersey sadly passed away, I got into contact with one of his former students, awesome US guitarist Lou DiBello. Long story short, I recorded four tracks for his upcoming new solo album! Great old school Hard Rock, think MONTROSE meets Ted Nugent! In your face! Featuring the legendary Ross The Boss (ex-MANOWAR) and bass player extraordinaire Mike LePond (SYMPHONY X). Once again, I had the fortune to sing for my dear friend, guitar master Tommy Vitaly. Once again, he managed to have an awesome cast of musicians working for him, so watch out for this Class A release later this year! Another no-brainer for me, a wonderful all star charity session by Marius Birkeland Danielsen and Anniken Rasmussen, featuring such an amazing cast of world class musicians, that it’s simply an honour for me, to take part! ...I even recorded some leads for the bonus DIO cover “Holy Diver” ;) nice, eh? So, that’s it for now. There might be a few others, which I will announce as soon as I’m allowed to. For the last few months I was secretly working for Canadian Rockers HEAVENS FIRE. I had the pleasure to write almost the entire album together with guitar mastermind JT Harris (and provided some backing vocals of course). Check out the new Marc Jürs mini album I did a little guest spot on here. It's been quiet for a while, but there's a lot coming pretty soon, I promise. Meanwhile, I recorded a track for US guitarist LOU DIBELLO. Cool, classic Hard Rock! More on that soon. I recently did some background vocals for German singer/songwriter Marc Juers. His first EP will also feature the likes of David Reece (ACCEPT, BANGALORE CHOIR) and the ever amazing Rob Lamothe (RIVERDOGS). 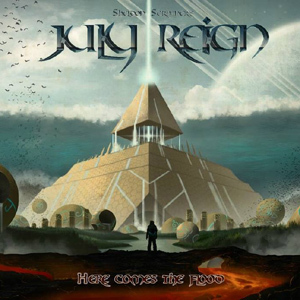 Check out Melodicrock Records' exclusive preview showcase of the upcoming Sheldon Scrivner's - July Reign debut "Here Comes The Flood"! Listen to each song and pre-order right away!!! I'm glad to announce, SHELDON SCRIVNER'S JULY REIGN will be out March 23rd on Melodicrock Records! This is Melodic Metal at its best and something, I'm really proud of. I did the entire album for guitar mastermind Sheldon Scrivner. This weeek I did my parts for a great charity project for the Ronnie James Dio Cancer Fund put together by Marius Birkeland Danielsen, which will feature an amazing cast of different musicians. Stay tuned for more info. I am pleased to announce you can now order my new solo album direct from the webstore. All CDs will be personally signed by myself, all for just 15 euros (including worldwide shipping). greetings from the Seegewerk Studio! Last night I started working on the debut album of French Prog Metal outfit DEVOID! Great stuff, watch out for that! I'm deeply saddened to hear about the passing of my dear friend Iain Ashley Hersey As some of you might know, I did sing for him on several records, but moreover Iain also was part of the SYNDICATE, as he contributed one fantastic song, "Into The Blue", to my upcoming album. I'm speechless. I'm hoping, this song will carry on his heritage forever - his music surely will live on forever!!! Sail away brother and say Hi to Ronnie, when you see him! 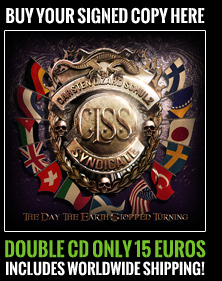 17/11/2015 - ONE MORE FROM "THE DAY THE EARTH STOPPED TURNING"
The one and only Dan Mann will be devoting a full ROCKPOSER'S ROULETTE show to my upcoming SYNDICATE album, playing the entire album (!) as a world exclusive pre-listening - tune in and don't miss it!!! 12/10/2015 WANT TO SPREAD THE WORD AGAIN?! PLEASE HELP. One more exclusive pre-listening tune from the upcoming CLS SYNDICATE album: "Head's Blowing A Fuse". This one was originally written by Robby Boebel and me for the never released 4th Evidence One album. POWER PROG is proud to announce the signing of one of Germany's premier voices of rock, Carsten 'Lizard' Schulz. 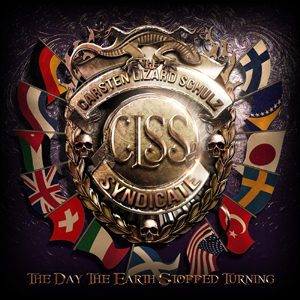 Now the common goal is the release of his first solo album "The Day The Earth Stopped Turning" under the flag of "Carsten Lizard Schulz Syndicate" at November 20, 2015 as Double CD, download card, digital download and stream, which was created with the participation of some really big names out of the current rock and metal scene. 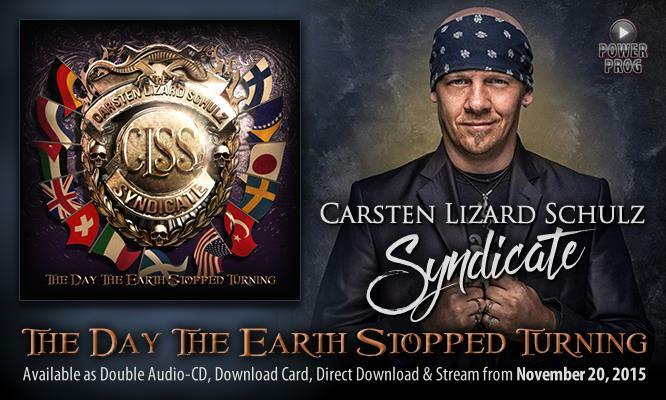 Carsten 'Lizard' Schulz is certainly no stranger to the international Rock & Metal scene and he can look back on a more than 20 years lasting and successful career. As lead singer and formative element of well known acts like DOMAIN, EVIDENCE ONE, CODE OF PERFECTION and MIDNITE CLUB in the first decade of the 2000s, he has influenced the German hard rock scene like only a few other artists. 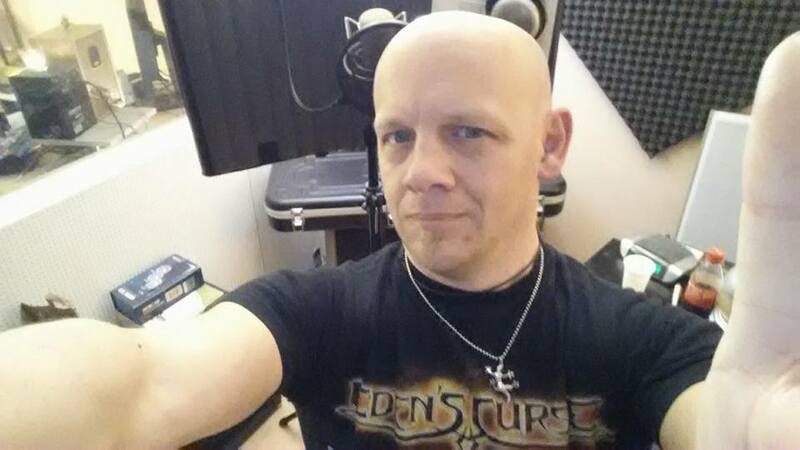 His lead singing skills can be also enjoyed on more recent albums by DEAD END HEROES, LAVALLE, RIK PRIEM'S PRIME, FROZEN RAIN and many others and as a guest singer he can be heard on countless other releases. But Carsten is also a highly sought-after songwriter. You can listen the works out of his pen on albums by RUSSELL ALLEN / MAT SINNER, VENGEANCE, GARY JOHN BARDEN etc. ... A real musical workaholic since years! A real labor of love is the realization of his first solo album "The Day The Earth Stopped Turning". A process that took many years to complete - on the one hand for reasons of time, to the other hand to present the best possible and identifiable result. 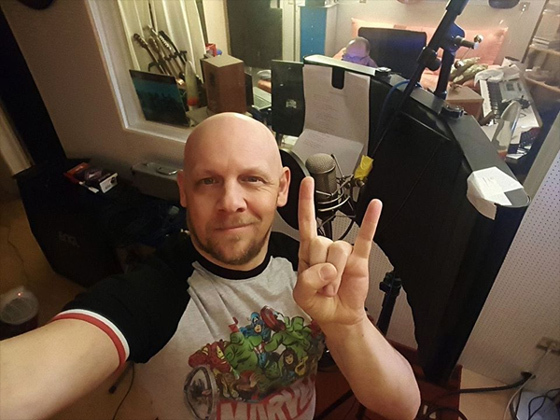 As a die-hard fan of the good old 70s, Carsten's clear intention was to create an adult and classical hard rock album with the special old-school flair. Under the decisive participation of his congenial partner Steffen Seeger and with the help and support by dozens of well-known artists from the last four decades (such as Axel Rudi Pell, Mat Sinner, Neil Murray, Erik Norlander and lots of others), a classic rock album has emerged that seeks of his peers in the current world of music and which is much more than a tribute to the good old days. A man, his friends and their mission give us an over 80 minutes lasting listening pleasure which brings us back to the past and to greats like LED ZEPPELIN, DEEP PURPLE, RAINBOW, WHITESNAKE, URIAH HEEP, NAZARETH, KANSAS, MANFRED MANN ... But hey, definitely no reheated brew, this is how straight sophisticated classic hard rock should sound today! Had a great time last weekend with Rik Priem's Prime at the Up The Belgians Fest ar de Kreun. Here' some footage on and off stage of the event. 2 CDs, 16 songs, 1 1/2 hours of Classic Rock! Keep your fingers crossed, that I will be finding a label crazy enough to release a double solo album of this mostly unknown little singer from Germany trying to revive the true Classic Rock spirit of the 70s! ...this album is dedicated to the loving memory of my Dad Egon Schulz, the best Dad on Earth! Great news, I'll be playing with RIK PRIEM'S PRIME at the Up The Belgians! Fest on March 7th in Kortrijk, Belgium! Check Tour Dates section for more info.